Sun damage, stress, and the natural process of aging cause wrinkles to appear around eyes. As collagen breaks down and skin dries out, lines become more visible. Since the skin in this part of the face is fragile and dry, it needs extra TLC. And what could be easier than simply applying one of the best eye creams? Regular maintenance of your skin can help you get rid of and avoid wrinkles, bags, crows’ feet, and fine lines. While it’s smart to use a face moisturizer, it may not be enough to care for your eyes, too. Eye creams are designed to add extra hydration, boost collagen and elastin production, and lighten dark circles. They are packed full of rejuvenating vitamins and ingredients that improve circulation to shrink bags and sagging skin. What ingredients are in the best eye wrinkle creams? Many times you’ll see eye creams with retinol or other Vitamin A derivatives like retinol palmitate. Retinol resurfaces skin to erase lines and wrinkles and even out pigmentation. It also increases collagen production so the skin has a firmer, tighter appearance. But if you use an eye cream with retinol, it can make your skin more sensitive to sunlight. Apply the cream at night and use a sunblock if you’re outside during the daytime. Another important component in many eye creams is hyaluronic acid. This is one of the best ingredients to hydrate and moisturize dry skin. And as the skin fills out with much-needed moisture, fine lines and wrinkles disappear. Then Vitamin C and B3, aka niacinamide, work together to thicken thin skin and fade away dark circles. Ceramide enhances the natural barrier in the skin to lock in moisture. And some eye creams even have caffeine to increase circulation and get rid of puffiness. Now that you know what makes up the best eye wrinkle creams, here are the reviews of our top picks for you. No one needs to look their age. Choose one of these top eye creams that erase fine lines and wrinkles, reduce puffiness, and fade dark circles. RoC’s Retinol Correxion Sensitive Eye Cream is formulated with a mild dose of retinol so it won’t irritate sensitive skin. This is good news since retinol is one of the best ways to fight signs of aging. And even with a lower content, the Correxion cream was clinically proven to erase wrinkles and dark circles. Besides retinol, the cream contains hyaluronic acid for powerful hydration that plumps up skin for a youthful appearance. There are two facts to consider if you want to use the Correxion cream. One, retinol loses its strength if it’s exposed to air and light. It’s important to tightly close the container and store it in a dark place. Two, retinol, even at a lower dose, can make skin more sensitive to sunlight and UV damage. Whether you use the eye cream during the day or at night (or both), be sure to apply sunblock of SPF 15 or higher during the day. Even if you stop using Correxion cream, continue to use sunblock for a week afterward. It’s no surprise if you’ve heard about StriVectin’s Eye Concentrate for Wrinkles. It’s a very popular anti-aging cream. It’s won awards from Allure, Beauty Choice, and The Times Magazine during the past decade. This new improved formula now contains more peptides as well as the NIA-114 niacin formula that rebuilds skin. The NIA-114 was discovered by scientists researching skin cancer. It rebuilds skin’s natural barrier against environmental damage and rejuvenates it. The ingredients list also includes resveratrol and caffeine. All these powerful components together make puffy eyes and dark circles disappear while they shrink wrinkles and erase lines. StriVectin recommends applying the Eye Concentrate twice a day. Perricone MD’s Firming Eye Cream is very hydrating and specifically designed to get rid of crows’ feet, wrinkles, dark circles, and bags. It’s safe enough to use on delicate, sensitive, and very dry skin. The formula depends on a blend of neuropeptides, olive polyphenols, and tocotrienols. Tocotrienols come from Vitamin E, a powerful antioxidant that reverses signs of aging and neutralizes free radicals that damage skin. Olive polyphenols are also antioxidants that rejuvenate skin. And neuropeptides are proteins that increase collagen production to firm up sagging skin. Olay Total Effects Transforming Eye Cream is a best-seller at a budget price. But don’t think this drug store item is cheap. Lots of users are very satisfied with it. Total Effects combines exfoliation and hydration to nourish and rejuvenate the skin around your eyes. It contains a VitaNiacin Complex—a blend of Vitamins E and B, to help skin renew itself naturally. As a result, you should instantly see your skin tone and texture improve. Then, over time, the cream makes dark circles go away and wrinkles fade. For best results, apply it in the morning and at night on clean skin. Just tap it gently around the eye area, then follow it with your daily moisturizer. The Total Effects cream is not greasy and it absorbs quickly so you can wear it underneath makeup. Baebody’s Eye Gel combines skin saving ingredients like hyaluronic acid, Matrixyl 3000, MSM, jojoba oil, Vitamin E, plant stem cells, and a host of herbal derivatives to erase signs of aging. The result is plumper, moisturized, softer skin with a brighter tone. Although the Baebody Eye Gel can restore your skin to a younger appearance, it can also protect you against sun damage. If you try it and don’t see results, they offer a full money-back guarantee. For those concerned about harmful chemicals and animal testing, the Eye Gel is cruelty-free and has no parabens or artificial dyes or fragrances. Vichy, one of the top European skin care brands, makes LiftActiv Eye Cream. It reverses signs of aging like dark circles and bags, reduces puffiness, and fades away fine lines. You can apply it both morning and night to clean skin for best results. The non-sticky, non-greasy formula is based on plant sugar, caffeine, and escine. It’s designed to wear well under makeup and is safe for sensitive skin. Vichy also makes LiftActiv with Retinol and hyaluronic acid, a formula that gets rid of deep wrinkles. It’s powerful enough to immediately plump and hydrate the skin around your eyes to give it a smoother appearance. Over time, it resurfaces the area around the eyes. But just because it’s powerful doesn’t mean it’s harsh. Vichy says this cream is safe for contact lens-wearers and it’s hypoallergenic and fragrance-free. Redermic C Eyes from La Roche-Posay contains fragmented hyaluronic acid that penetrates deep into skin. It immediately diminishes rough texture around the eyes and works over time to erase wrinkles altogether. The Redermic “C” formula is made for morning application, while the “R” formula is for at night. The “C” stands for Vitamin C, which has a skin brightening effect. The day cream is made to wear well under makeup. AHAVA, the Israeli company that bases their products on minerals from the Dead Sea, offers their Time to Hydrate Gentle Eye Cream for sensitive skin. It’s packed with botanical ingredients, minerals, and vitamins that revive dry skin. The formula is cruelty-free and vegan, plus it contains no GMO ingredients, no petroleum derivatives, no sodium laureth sulfate, and no parabens. And even though it has a rich texture, it sinks in fast. Paula’s Choice line of skin care products are cruelty-free, fragrance-free, and safe for sensitive skin. The RESIST Anti-Aging Eye Cream is made for night-time use to allow it to work while you rest. Dab it on, applying a generous layer, for best results. It contains antioxidants, peptides, and shea butter to fully hydrate the skin around your eyes. This means it diminishes the appearance of wrinkles, lines, and puffiness so you look and feel younger in the morning. LilyAna Naturals makes their Eye Cream Moisturizer in small batches so it arrives fresh. That’s important because they make it with certified organic ingredients like hibiscus extract and rosehip oil. It contains no parabens, no artificial dyes or scents, plus it’s cruelty-free. If you don’t love it, they have a 30-day money-back guarantee. What does this moisturizer cream do? They say it evens skin tone, reduces scarring, erases wrinkles, and restores elasticity. If you wish to apply it to other areas like your neck and the rest of your face, you can get the same great results there, too. If you love Dead Sea mineral products, try the Calily Life Eye Cream. It contains minerals, organic ingredients, and hyaluronic acid for maximum hydration and skin repair. The rich formula is good for both daytime and nighttime use. It’s not greasy so you can wear it under makeup. The formula is made without parabens and it’s safe for sensitive skin. It can reduce inflammation, shrink puffiness, fade dark circles, and plump up skin to erase wrinkles. It also protects against new damage from the environment. Burt’s Bees leaves out petroleum products, phthalates, and parabens in favor of 99% natural ingredients. Their Intense Hydration Eye Cream depends on the power of Clary Sage, an herb that will help your skin retain moisture. The more hydrated your skin is, the younger and smoother it appears. The non-greasy formula can be worn under makeup during the day, or applied at night. It begins working immediately to smooth skin and erase fine lines, and over time, diminishes wrinkles. Both guys and gals are fans of Brickell’s Restoring Eye Cream. It’s an unscented moisturizer packed with powerful ingredients. It contains MSM, Matrixyl 3000, hyaluronic acid, and caffeine. The caffeine is from green tea. It speeds up blood circulation in the skin to get rid of puffiness and dark circles. Hyaluronic acid is an excellent moisturizer that helps skin look and feel younger. Matrixyl 3000 is made from protein peptides that increase collagen production to firm up skin. And MSM, or Methylsulfonylmethane, fades age spots and brightens skin. Brickell recommends applying a small amount underneath eyes in the morning and at night. You should see fewer wrinkles in two months. And if you apply a pea-sized amount twice a day, the container will last for about a month and a half. 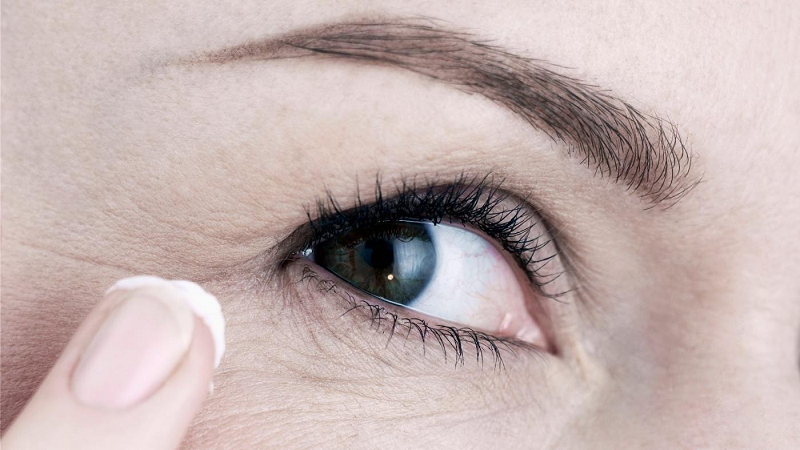 Eye creams are great for treating wrinkles. But what can you do to avoid wrinkles in the first place? The basics may be very obvious, but they’re still true. Smoking and over-exposure to the sun both cause wrinkles. If you cut back or quit smoking and wear sunscreen, you’ll save your skin a lot of trouble. Sleep is also very important, but did you know that it’s best to sleep on your back to avoid wrinkles? And invest in some silk pillowcases to protect your skin even more. A healthy diet is essential, along with drinking plenty of water. How much water? Shoot for half your body weight in ounces---i.e. if you weigh 150 pounds, drink 75 ounces of water. Obviously, using a good quality moisturizer is essential. Don’t skimp on applying it both day and night. If you find one with Matrixyl 3000, that’s an effective anti-aging ingredient. It can almost double the amount of collagen in your skin. There are many cosmetic treatments that can erase wrinkles or make them disappear. Some, like facelifts or injections, are invasive and require surgery. But others don’t require anesthetic or any recovery time at all. Check out our review of anti-aging devices. The secret of this eye cream is in the ingredient. 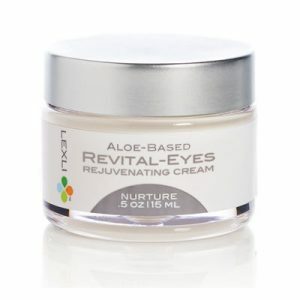 It uses aloe vera, a natural ingredient that is known for being able to fight wrinkles in the eye area. It has peptides, which are important to boost the production of collagen. In turn, this makes the skin around the area firm. Aside from aloe vera, this eye cream also contains chamomile and licorice extracts, which are known for their anti-inflammatory properties. Chrysin and N-hydroxysuccinimide, on the other hand, are the ones that are responsible for the reduction of undereye circles. Meanwhile, it also has olive leaf, cucumber, and green tea extracts that can effectively fight skin damage caused by free radicals. With the combination of these ingredients, you won’t only be able to fight wrinkles, but you can have a healthier and glowing skin that will defy other visible signs of aging. If you love your laugh lines, that’s great. Being confident and relaxed about your appearance is a healthy attitude. Wrinkles are not the end of the world. But if you want to keep your skin in top shape, we hope our reviews helped you select the best eye cream today. Visit us again soon to see new reviews of the top trends in beauty products.